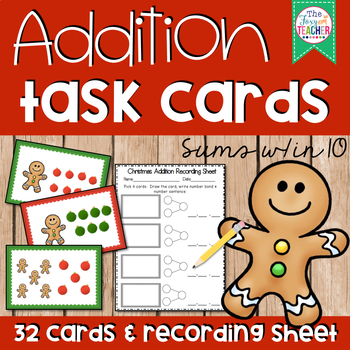 Make math fun & engaging with this Christmas-themed set of addition task cards and coordinating work mat & recording sheet! 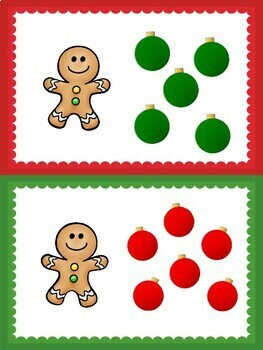 Set of 32 picture cards (2 per page) feature gingerbread and ornament graphics and can be used to support Common Core math standards K.OA. 1 and 1.OA.1, addition within 5 and 10. 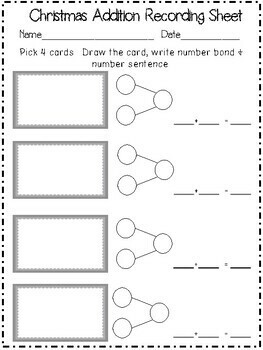 Laminate the work mat or slip into a page protector to create a reusable surface to work through the set of task cards. Work mat includes space for students to write the number bond and the number sentence. Set includes answer cards for a self-check option (laminate on the back of the picture card). Recording sheet included. 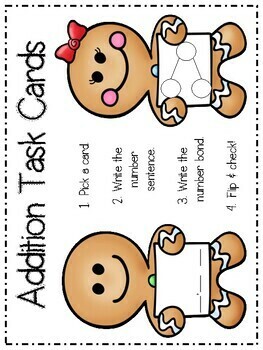 Cards could also be laminated and used as flash cards in instruction.